This is a multi-functional smart watch. Support Android 4.4 and above, IOS 8.0 and above, BT 4.0 version. It will give you great experience! Analog-digital time display provides more accurate time display. Remind you if there is a message or a call coming. Support Android 4.4 and above, IOS 8.0 and above, BT 4.0 version. Water resistant (3ATM): Daily water resistance (not for showering and swimming). 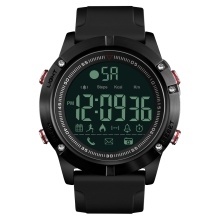 Functions: Time, week, date, alarm, pedometer, calorie, distance, call remind, BT, remote camera, backlight. Support daily water resistance (not for showering and swimming). Don&apos;t press any button in the water.